Email workflows. They are a powerful little marketing tool that seems to be growing in their fierceness every day. You know they work, too, because when you open your inbox and you see those customized emails about products you love with information that's seemingly catered right to you, it proves it. But how can you create these perfectly personalized processes so they function well for your lead database? The answer lies in HubSpot and the workflow tool. But since you're reading this, you probably found out that they can be a little confusing. Even though HubSpot is always working on making the workflow tools as easy-to-use as possible, one wrong move can throw the whole thing off, sending the wrong things to the wrong people and pretty much causing marketing havoc. STANDARD: This type triggers emails whenever they meet the starting conditions of a workflow. Delays are dependent on whenever a contact is enrolled. FIXED: This triggers contacts whenever they meet the starting conditions of a workflow. Delays are fixed, and dependent on set a date. 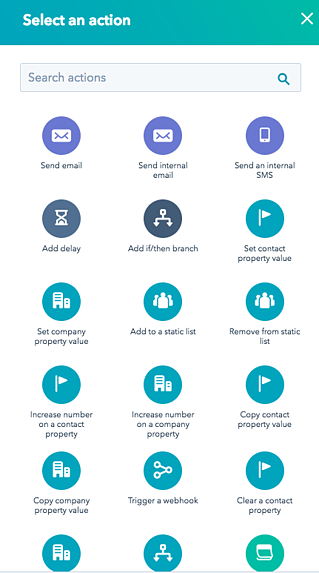 PROPERTY-BASED: This workflow requires you to select a date-type property, and any delays set in this workflow are relative to the date value listed on the contact’s record. MANUAL: This option will allow you to set up your workflow to perform your desired actions and then manually enroll contacts into a workflow. Choosing this option will not enroll any contacts unless you decide to do so. 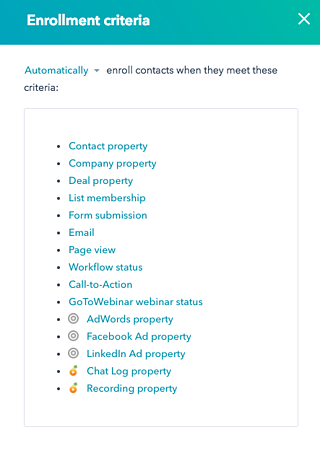 AUTOMATIC: This option will dynamically enroll contacts as they meet the criteria you set within the workflow. You’ll be prompted to decide what criteria you want your contacts to meet in order to join the workflow. BRANCHES: Branching logic means that you can have your contacts follow one path or another based on an action in your workflow. For example, if you send someone an email, you can have that contact receive different content depending on which option they click, A or B. DELAYS: In standard workflows, when a delay is added, that delay is relative to the previous action. When an action executes, the next action is scheduled. If that action is a delay, the workflow will wait the specified time before it moves onto the next action. There's a long list of actions you can select, we highlight all of them in our workflow guide. Did I mention it's available for download right here? When planning a HubSpot workflow, you may determine that your workflow needs to be more specific, in terms of its logic and what it does and does not allow. Workflow settings can help you control your workflow’s behavior. Should the workflow steps execute only on business days or within a certain time range? When a contact is enrolled in this workflow, should they be removed from any other workflows? Are there any contacts that you want to prevent from being enrolled in this workflow? 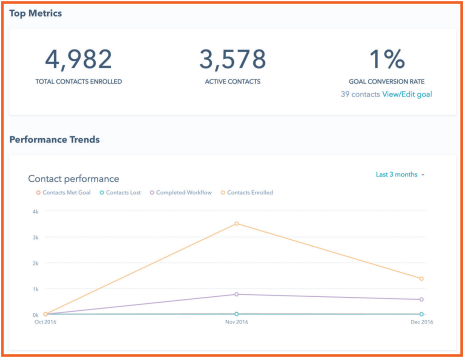 GOAL LISTS: A unique advantage of HubSpot’s Workflows tool is its ability to track your workflow’s performance towards a focused goal. Setting a goal list will be key to many of your workflows as you’ll be able to see at a quick glance how the workflow measures up. After your workflow has been active for some time, you will want to assess the effectiveness of your workflow. 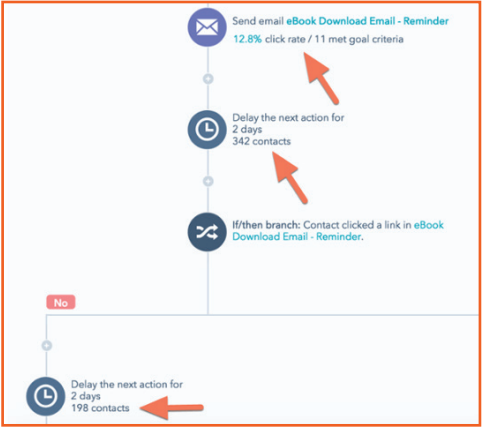 ACTIONS: Each step will reveal a little bit more about the engagement of an action, so you can see if contacts in your workflow are opening/clicking on emails, are in a delay, or have met the workflow’s goal criteria. PERFORMANCE: In your left-hand navigation, you’ll find Performance. This screen displays your contact performance as well as your email performance per individual workflow. You’ll see a quick overview, first, of your workflow performance in terms of its conversion rate. Below that, you’ll see the section Performance Trends that shows a visual representation of how many contacts enrolled in your workflow, completed your workflow, were lost, and met the goal per any given time period. You can select the date filter at the top-right of this section to see a very specific time or change that to a custom date range so you can get a better idea of how the workflow has performed over an extended period. Before activating your workflow, you may want to test it to view the sequence of events in action. 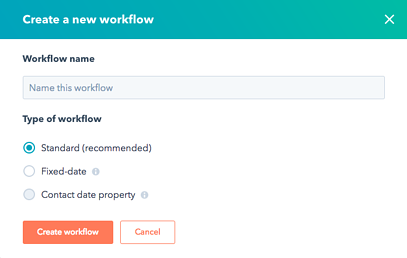 When you are testing a workflow, it actually sends your test contact through the workflow, providing you with visibility into how it functions, providing insights into any areas where you may have missed a step.